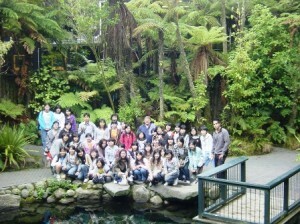 Rotorua is an excellent choice for tour groups. It is the main tourist destination in New Zealand and has a wide range of tourist-based activities from spectacular geysers and mudpools, to farm shows and Maori culture. The city is just 3 hours south of Auckland and one hour from both Lake Taupo and Tauranga.Our school has had a number of groups who have travelled to New Zealand to study English over the years from countries including – Japan, Argentina, Qatar, Saudi Arabia, China, Hong Kong, Thailand, New Caledonia, Tahiti, Taiwan and Korea. These tour students have varied greatly in age from young teenagers up to 70 year olds! Click tour reference to read a reference from a recent group to the school. Arrive in New Zealand and transfer to Rotorua. Some groups also choose to do intensive English lessons in both the mornings and afternoons. Each student aged under 16 on a tour group will be brought to school each day and then picked up again and taken home at the end of the day. Please see the document titled Class Division for Tours for information on how we divide tour group students into classes. Maximum class size is by negotiation with the tour organisers. It will depend on the needs of the group. We are not able to guarantee single homestays for groups. For the peace of mind of students 14 and younger, it is strongly recommended that they share a bedroom with another student in the tour. We have found that young students tend to become homesick if they are on their own in a homestay and need the support of another student. For other students we will make every effort to provide a separate bedroom for each member of the tour but we can’t guarantee this. They may have to share a room with another student in the tour. We welcome tour leaders to the school to help us with the group. Each group that comes is given an FOC tour leader. This means that the activities, transfers, and lunch enroute to and from Auckland are free for them. They still need to pay for their accommodation, meals and air tickets. The number of FOC tour leaders provided by RELA depends on the numbers in the group. See Information for Tour Supervisors for more information about the responsibilities of a Tour Leader. Please read our Group Student Policy and contact Jan for more information and a quote.